Haloarenes are the halogen derivatives of aromatic hydrocarbons in which halogen is directly attached to the ring. these are obtained by replacing hydrogen by alpha-halogen atom. A general method for preparation of Haloarenes. 1. By direct halogenation of aromatic hydrocarbon. Aromatic hydrocarbon is hydrogenated directly at dark in presence of Lewis acid such as AlCl3, FeCl3, FeBr3 to produce corresponding haloalkanes. The reaction of an aromatic hydrocarbon with iodine is reversible. Therefore, iodination is carried out in presence of oxidation agent like HNO3, HIO3 etc. with accelerate the rate of forward reaction. Diazonium salts. is obtained by adding the ice-cold solution of NaNO2 slowly on aniline in HCl. This reaction is Known as diazotization. When benzene is chlorinated directly with Cl2 in presence of FeCl3 at room temperature chlorobenzene is obtained. To get chlorobenzene from aniline,aniline is first converted into benzene diazonium chloride. The product thus obtained is then reacted with Cu2Cl2 in presence of HCl to get chlorobenzene. For that, phenol is first refluxed with Zn-dust to get benzene. Then chlorination of benzene is carried out as to get chlorobenzene. 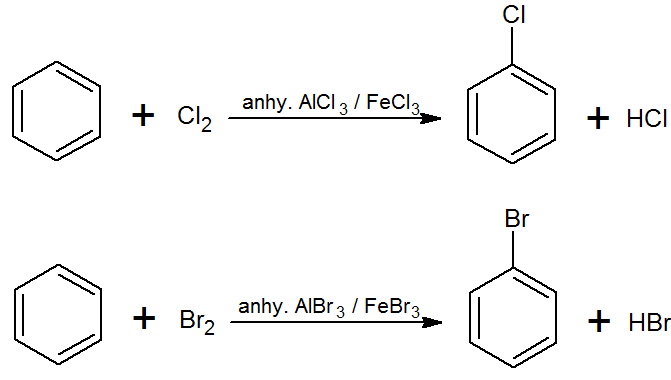 Preparation of chloroand bromobenzene (Sandmeyers reaction). When benzene diazonium chloride is treated with (Cu2Cl2+HCl) and (Cu2Br2+HBr)separately. corresponding chlorobenzene and bromobenzene are formed. This reaction is called Sandmeyers reaction. Iodobenzene is obtained by adding aueousKI solution to benzene diazonium chloride. Defination and types of haloalkanes. Any Questions on 'Haloarenes and Method of preparation of Haloarenes '?